Bud Frazier stands beside the car he drives for his races in his son's garage. 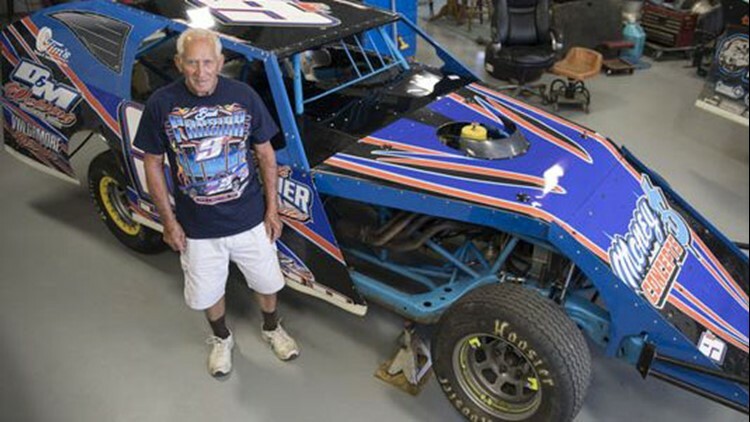 Frazier started racing in the 1960s when safety was not much of a concern in racing and admits he has seen a lot of changes in his almost half-century career. Even though he doesn't keep count, Bud 'The Legend' Frazier estimates he's won about 350 to 450 races in his lifetime. FRANKFORT — Mark Frazier just laughs when his father says this will probably be his last year of racing. "He's been saying that since 1980," Mark said. After Bud "The Legend" Frazier's performance last weekend in the Sport Mods division at Atomic Speedway, he may want to push that retirement date back just a little further. Having already won his heat, Frazier ran near the front of the pack for much of the feature race in the division. Then, with just a few laps remaining and running second, he saw an opportunity. "With three laps to go, I saw the lap car and thought he might play into this game," said Bud. "Sure enough, we caught him down in (turns) one and two and (racer Blake Sheets) went low and when he did I just drove through him." Passing on the outside in the final lap, Frazier took the checkered flag and made his way to victory lane — just another day at the proverbial office for the 83-year-old. That's not a typo. Bud Frazier still has a passion for careening around a racetrack nearly six decades after first getting behind the wheel. He realizes he's fortunate to still have the reflexes and stamina to compete and win against competition that in some cases wasn't even born until he was in his 60s, something he credits to "good genes" from a mother who remained active into her mid-90s. His love of racing developed in the 1960s as a shared experience with his brother, Joe, and brother-in-law, Jerry. "I just went down and watched (the racing) a couple of times and got a little excited and thought, 'Well, I could do that,'" Bud said. "So the next year, me and my brother and brother-in-law ... bought us a car, the three of us, and took turns driving it. The next year I had my own car and I started winning. "I've driven everything they run down there (at Atomic), and now I've won in everything they run down there — sprint cars, late models, modifieds." Racing, in fact, became a family passion. Joe and Bud were inducted together in the first Atomic Speedway Hall of Fame class, while Mark, who vividly remembers spending plenty of time around racetracks as a child, also recently was inducted. "I was at my first race when I was six weeks old," Mark said. "I grew up traveling all over the United States watching my dad race. Back in the '70s, he traveled quite a bit (running blacktop and dirt) so we traveled all over pretty much the eastern half of the United States. I grew up at the racetrack every Friday, Saturday and Sunday night, it seemed like." One of Bud's career highlights, he said, came during that period in 1975 when he took part in the Little 500 in Anderson, Indiana, a sprint car event conducted a week before the famous Indy 500 race. The race features 33 cars starting three-wide — something of a rarity with sprint car racing because tracks are normally too narrow for a three-wide start — on a quarter-mile track. In deference to the Indy 500, the cars make 500 laps of the oval. "In 1975, (Bud) was the fastest of 100 cars (to attempt to qualify), and he qualified for the pole of the Little 500," Mark said, after which his father lovingly recalled his then-10-year-old son's excited reaction to the feat. In a society obsessed with metrics and statistics, one may think Bud would know exactly how many races he's won over the course of his career. He's never kept track, however, although Mark said family estimates have the number at somewhere between 350 and 450 feature victories. He does know that at some point or another during his career, he has been crowned the Atomic Speedway track champion in each of the classes that have run there. What he's been able to accomplish has impressed Atomic Speedway owner Brad McCown. "I've said to people what are the chances that any of us will be alive when we're 83, and he's still out here doing things that 20- and 30-year-olds want to do," McCown said, also praising the Fraziers' roles in the community. "It's just remarkable that his health and everything allows him to do what he is doing." For every minute spent behind the wheel, Bud and Mark spend countless others in the garage getting the cars ready for the next weekend of racing. With advances in technology, they've had to adapt to new ways of doing things since those early days when there were no roll cages or other safety measures standard in today's cars. "I've got a picture of my dad racing sprint cars back when they didn't run with roll cages," Mark said. "All you had was a piece of tubing behind your head and you raced your car. I can't believe how brave that was. They didn't have racing seats, they just had a lap belt, and not even good helmets." As a result, Bud and Mark have known their share of drivers who suffered severe injuries and even death in a race car. Even so, they said real fear has never entered into the equation for them, with their experience and reflexes serving to calm their nerves. Bud, in fact, said he's well past the point of getting very excited while on the track. The reaction to last weekend's victory, however, did make an impact. "I never even thought about it, I figured you win a race, you just win a race," Bud said. "Then, when I climbed out of the car, there wasn't a person in the stands, they were all standing down at the fence and I knew then that it was something." Congratulations also came from nearly all of his fellow drivers following the race, and a post-race video posted on the Atomic Speedway website as of Friday had more than 104,000 views and dozens of comments offering well wishes. While touched by the outpouring of support, there's no resting on his laurels for Bud. He was immersed on Thursday in preparations for another weekend of racing. Despite a forecast of extreme heat, he couldn't be happier.